Design studio specialising in sustainable contemporary outdoor spaces established by award winning designer Richard Rogers. We work on residential and commercial projects and cover all types of outdoor space, from master planning country estates to small urban courtyards to care home gardens. We provide a complete design package with the ultimate aim of bringing into being beautiful outdoor spaces that people love and do not want to leave. Innovative design studio founded by award winning designer Richard Rogers. We work across the Cotswolds, Chilterns, Surrey Hills, London and home counties. The brief was to combine a beautiful private garden with a landscape that can be used for ‘Eco-therapy’ (psychotherapy outdoors). Redesign a courtyard for merchandising a premium range of Cretan terracotta pots and provide a café area for customers. Redesign care home gardens for a richer sensory experience to help residents with dementia and other age related conditions. Commission to design this front garden in Kingston where light was restricted by a railway embankment and mature trees. Create a beautiful outdoor space that would meet all the needs of a growing family whilst adding significant value to the property. Send us your details and we’ll give you a call at a time that’s convenient for you. Gardens – a vision of paradise? Success! Thank you for signing up to our newsletter. 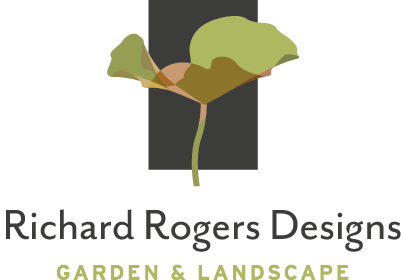 Innovative garden and landscape design studio working across the Cotswolds, Chilterns, Surrey Hills, London and home counties.